As the parent of a young child, I know we’ll one day make the trip to Disney World as a family. Unfortunately, Disney World gets more expensive every year. I know because we’ve been a few times before we had kids. Each time we went, it got more expensive. In fact, Disney World has gotten so expensive it is a major stretch on a family’s budget to make the trip. That doesn’t change the fact that Disney World is an amazing experience for most families. Thankfully, there are ways you can get tickets to Disney World for the whole family for free. You’ll just have to do a bit of financial footwork to make it happen. Before I share exactly how to get free Disney World theme park tickets, please make sure to read my Rules For Playing The Credit Card Rewards Game to make sure you’re not getting into financial trouble just to get some free Disney World tickets. The goal is to use credit card rewards to completely offset the cost of your Disney World ticket cost. You’ll still have to “purchase” your tickets, but your credit cards will wipe out the charges with statement credits before you would have to pay them off. Now that we have that out of the way, here’s what you need to know. 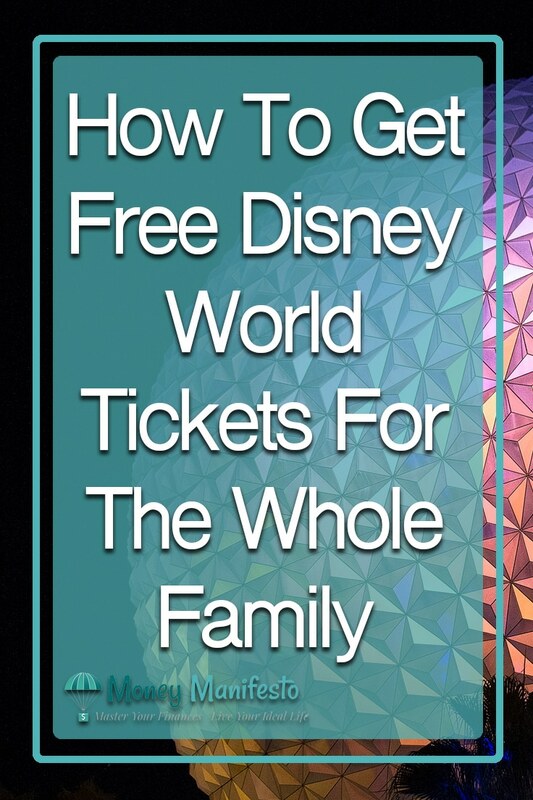 In order for this trick to work, you need to know how much money Disney World tickets will cost your family. This is very important so you can decide which credit cards to get and to calculate the amount of rewards you need to earn before you get started. Let’s assume you want to take your family to Disney World for four days. You can get a four day pass that allows you to visit one theme park per day for a discount versus paying the gate price each day. However, in order to get your tickets completely for free, you won’t be buying directly through Disney. Instead, you should buy through an authorized Disney reseller that codes their credit card transactions as a travel purchase. You’ll see why this is important a bit later. While the savings aren’t huge, every little bit helps. Even more important, they code purchases as a travel purchase allowing this method to work. You’ll want to calculate the total cost of tickets for your family. A family of four with 2 adults and 2 children between the ages of 3 and 9 would have a total ticket cost of $1,494.42 through Undercover Tourist based on the information above. I should also note if you’re a Florida resident, like we are, you can qualify for steep discounts on Disney World tickets. Some Florida resident tickets have blackout dates, so make sure to take that into account. Now it’s time to figure out how to earn the credit card rewards you need for free Disney World theme park tickets. Credit card rewards are a powerful tool, but most people never accumulate enough to earn free Disney World theme park tickets for the entire family. Even if they do, it could take years. Thankfully, there’s a completely legal and ethical shortcut to earn enough credit card rewards to pay for your Disney World tickets in a relatively quick manner. I say relatively quick because it may still take a few months to as long as a couple years to earn the rewards you need depending on the size of your family. However, it’s totally worth the wait to get free Disney World tickets if you ask me. Credit card companies offer sign up bonuses as a way to entice you to try out their credit cards. These bonuses can be huge and are often worth as much as $500 or more depending on the card and the offer. Some people have a hard time understanding how exactly this whole credit card sign up bonus thing works and whether or not it’s a good idea or not. For those people, please read this post explaining how credit card sign up bonuses work in detail then continue on with this post. For everyone else, trust me when I tell you credit card sign up bonuses work. I’ve been earning them for years and have used them to completely pay for multiple cruises for my family. The key to earning credit card sign up bonuses is applying for the right cards and executing a plan to earn the bonus rewards points. Most cards give you a set time period after signing up for a credit card to spend a certain amount of money to earn the bonuses. For instance, the Capital One Venture credit card offers 50,000 bonus miles if you spend $3,000 within the first 3 months. Those 50,000 miles are worth a $500 statement credit when redeemed against a travel purchase. The time period starts the day you’re approved from the card even though you won’t get it for a few days, so you really need to be able to spend $3,000 in a little less than 3 months to earn the bonus. In addition to the sign up bonus, you’ll also earn 2 miles on every dollar spent. If you only spend the $3,000 required to earn the bonus, you’ll end up with an additional 6,000 miles worth $60. Your Disney World ticket purchase will need to be put on the card so you can redeem your points against the purchase and get a travel statement credit. That means you can count your ticket price toward your $3,000 of spending. The Capital One Venture credit card has no annual fee for the entire first year you have it. However, after the first year there is a $95 annual fee if you decide to keep the card. If you’re ready to get started, you can apply for the Capital One Venture credit card here. If you’re wondering how one credit card that earns you $560 will completely cover your family’s Disney World ticket cost, you’re on to something. It won’t. Instead, you’ll have to sign up for multiple credit cards over a few months to earn enough rewards to pay for your tickets in full. If you have a significant other, they can apply for the same credit cards you apply for and earn the bonus, as well. My wife and I do it all the time. That means the Capital One Venture card actually offers $1,120 in value if you and your significant other both get the bonus on the card. Make sure you don’t apply for the cards at the same time, though. You’ll want to make sure you can each hit the $3,000 minimum spending requirement for the sign up bonus within the three month time period. Now that we have $1,120 toward free tickets, you probably still have a little more money you need to earn to pay for your family’s tickets in full with credit card rewards. Here are a few other credit cards you may want to consider to earn the rest of the rewards you need. You can always view our list of the best credit card sign up bonuses here. We update it at the beginning of each month. The Chase Sapphire Preferred credit card offers 50,000 bonus points for spending $4,000 within the first 3 months of cardmembership. You can use those points to get cash back in the form of a statement credit or direct deposit into your bank account at a value of a penny per point. You’ll also earn 2 points per dollar spent on travel and dining purchases and 1 point per dollar spent on all other purchases. This guarantees you at least another 4,000 points for a total cash back value of $540 at a minimum. There is no annual fee during the first year, but at $95 annual fee each year after the first if you decide to keep the card. If you’re planning to use credit card rewards for other trips, you may not want to use this card for Disney World tickets. I say this because the Chase Sapphire Preferred credit card is a very versatile rewards credit card. If you use the points for cash back to pay for Disney World tickets, you’re technically losing out on value you could use for other things like hotels and airline tickets through transfer partners or booking directly through Chase’s travel portal. However, if all you care about is free Disney World tickets and you won’t touch another rewards credit card afterward, this card can help. 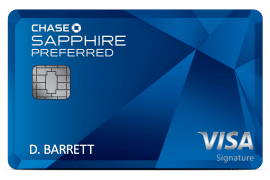 You can apply for the Chase Sapphire Preferred credit card here. 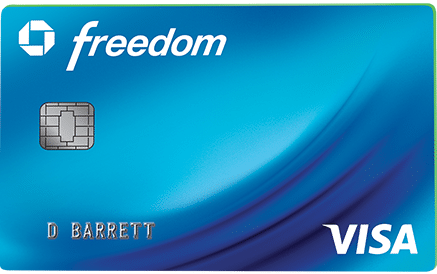 The Chase Freedom credit card offers $150 cash back after spending just $500 on purchases within the first 3 months of cardmembership. You also earn 1 percent cash back on all purchases and 5 percent cash back on up to $1,500 in purchases each quarter in rotating categories. The Bank of America Travel Rewards credit card offers 20,000 bonus points after spending $1,000 in the first 90 days after account opening. Additionally, you’ll earn unlimited 1.5 points per dollar spent on all purchases giving you a total of 21,500 points after earning the bonus. Points can be redeemed for travel statement credits at a value of a penny per point, so the 21,500 points are worth $215 in travel statement credits. It’s important to realize you need a travel statement credit to get the maximum value of your rewards, so you’ll need to purchase a ticket with this card. While you won’t have enough points to pay for a full Disney World ticket, you can use the cashback from a card like the Chase Sapphire Preferred or Chase Freedom credit cards to pay for the difference. There is no annual fee with the Bank of America Travel Rewards credit card. You can apply for the Bank of America Travel Rewards credit card here. 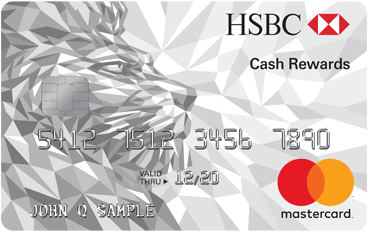 The HSBC Cash Rewards Mastercard offers $150 cash back after spending $2,500 in purchases within the first 3 months from account opening. You’ll earn 1.5 points per dollar spent on all purchases, as well. Here’s what I would do if I needed to earn $1,494.42 to pay for Disney World tickets for a family of four. You can complete this process in just 9 months. If you’re going to use this method, make sure to bookmark this page or pin this post to your Pinterest account so you can complete steps 2 and 3 at the appropriate time. First, I’d have one person apply for the Capital One Venture credit card. Once I had spent at least $2,252.79 on the card, I’d buy an adult ticket and a child ticket for $747.21 to complete my $3,000 of spending. Once the bonus points post to my account, I’d immediately request a travel statement credit of $560 against my $747.21 purchase for my Disney tickets, leaving $187.21 left unpaid by rewards. It’s important you pay the balance off in full, so use some cash to pay for the $187.21. You’ll get the money back in step 3. Next, have the other person apply for the Capital One Venture card. Again, spend at least $2,252.79 on the card then purchase one adult and one child ticket for $747.21 to complete the $3,000 spending requirement. Again, after the bonus points post to the account, I’d immediately request a travel statement credit of $560 against my $747.21 purchase for the last two Disney tickets. leaving $187.21 unpaid on this purchase and a total of $374.42 unpaid in total. Pay off the remaining $187.21 which you’ll get reimbursed in step 3. If you’ve decided not to pursue credit card rewards after your Disney trip, apply for the Chase Sapphire Preferred credit card and spend the $4,000 required within the first three months to earn at least $540 in cash back. Once the points post, request a statement credit or direct deposit to get your cash back. This will more than cover the $374.42 unpaid at this point, leaving you with at least $165.58 in leftover cash back to spend on your Disney trip. If you want to pay for your Disney trip without any cash out of pocket, switch step 1 and step 3 to earn the cash back for the Chase Sapphire Preferred first, then use the cash back when purchasing tickets using your Capital One Venture cards. If you have a bigger family and need more credit card rewards to pay for your tickets, simply apply for more credit cards and earn more credit card sign up bonuses. Your spouse could also apply for a Chase Sapphire Preferred credit card to earn another $540 in cash back or you could try the other credit cards mentioned above. If you make and follow a plan, you can get Disney World tickets absolutely for free for your whole family, even if you have a larger family. It may take longer if you have a bigger family, but as long as you plan everything out you should be just fine. One last thing you need to keep in mind. Disney World tickets do expire, so make sure you factor in expiration dates if it will take a year or two to earn enough credit card rewards to pay for your tickets in full. Are you going to get free Disney World tickets for your next Disney World vacation using the credit card rewards method? I’d love to hear about your plans in the comments.